I have a 2.5 year old puppy. I purposefully don’t say 2.5 year old dog because she’s a lab and she’s still fully puppy. She enjoys eating any paper she can get her mouth on, TV remotes, and sticks. And she can sometimes be a terrorist. Recently she’s started doing this thing where she wakes up at two in the morning and growls at us. She doesn’t bark, just growls. It’s as annoying as it sounds. To combat her growling, I’ve started trying to wear her out by walking her around the neighborhood right before going to bed. With it getting darker earlier, these walks have started being after dark. As we walk around the neighborhood, I’ve found myself walking in the middle of the road. 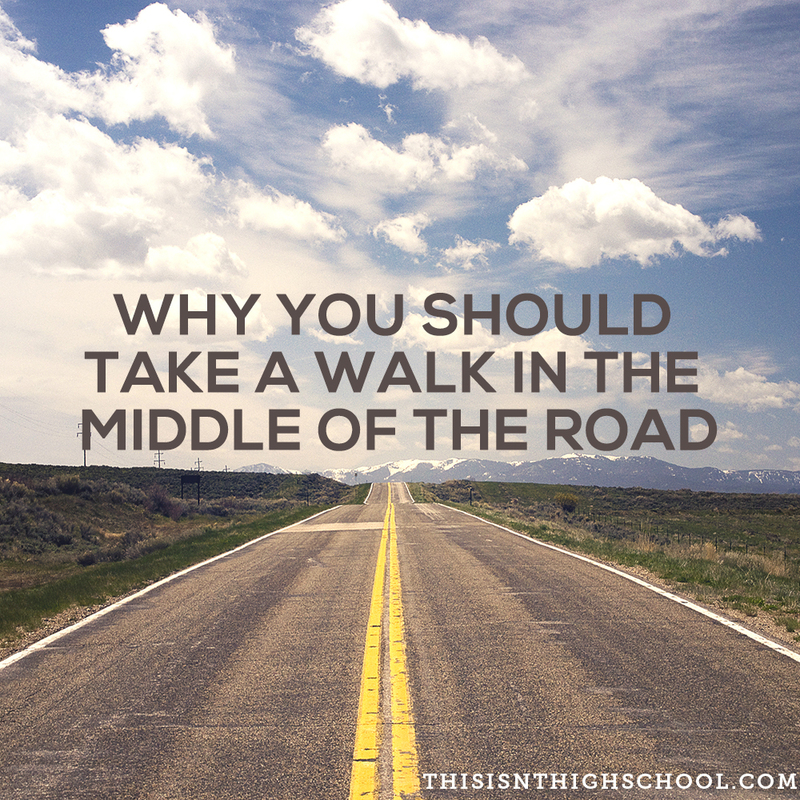 I don’t know if I started doing that because I was bored or because I was told not to as a kid, but the middle of the road has become my go to path. There’s something about the middle of the road that’s freeing to me. It allows me to not worry about running into a ditch or tripping on the curb as the puppy pulls me to every mailbox on every street. With nothing but me, the puppy, and a wide open suburban street, I’m left with the time and space to dream. I dream about the idea of one day writing a book. I dream about what it’d be like to be a free-lance designer. I dream about the life Nicole and I have been creating over the last 4.5 years and what the next 50 might look like. The dream is different every night, but I know I can always find it in the middle of the road. Where’s your middle of the road? What’s the place you know you can go to that’s free from all boundaries of logic and fear? Chances are, the answer just popped in your head as you read that question. When’s the last time you went there? Do you visit often? Why not? Life is tough. We have day to day responsibilities and obligations that keep us in the weeds. If we’re not careful, the weeds will grow around us and take over our lives. Take some time and visit your middle of the road. Schedule it into your calendar if you have to. Every big moment starts as a goal. Every goal starts as a dream. Every dream starts in the middle of the road.